I have finished a couple of little quilts I started in the art quilting class I took from Marilyn Belford last spring. The first is a still life made using the Broderie Perse technique. The background is a commerically made gradated fabric for the lower part and a light mottled print for the top. A lighter gradated fabric was used for the pear. A fusible web was placed on the back of a rose floral print and the individual flowers cut out. Leaves were cut from a green fabric, and a vase shape made from the black. Then the pieces were arranged in a pleasing manner and fused down. This process is fun and relaxed, since the pieces can be rearranged at will before fusing. After fusing, the pieces were sewn down using free motion. A stabilizer was used on the back to keep the top from puckering during this stitching process. Coordinating borders were added and the whole thing quilted. Walking foot quilting was used for the straight lines and free motion for the rest. A rose floral arrangement made using the Broderie Perse technique. The second quilt is one that was a series of exercises in use of “negative space”. Fusible web was placed on the back of a rectangle of green. It was then cut up into smaller shapes, mostly rectangles. The pieces were spread out on top of a blue print to leave gaps between. I had to add a few additional small pieces to “fill in” the whole rectangle. The pieces were fused down and stitched around the edges with a decorative stitch. I then added the green border and did the binding in the blue print. I wanted the binding to be a design element, so I cut 3 inch wide strips and sewed the binding on with a 7/16 inch seam allowance. This results in a nice wide binding and the corners really miter into nice sharp points! The rectangle and borders are done slightly asymmetrically – partly due to the placement of the cut up rectangle on the original piece of blue print. I think it would have been better if I had either kept it all symmetric (cutting off some of the lower blue print) or made it more asymmetric, so that it looked more deliberate. The quilting was all done with a walking foot. 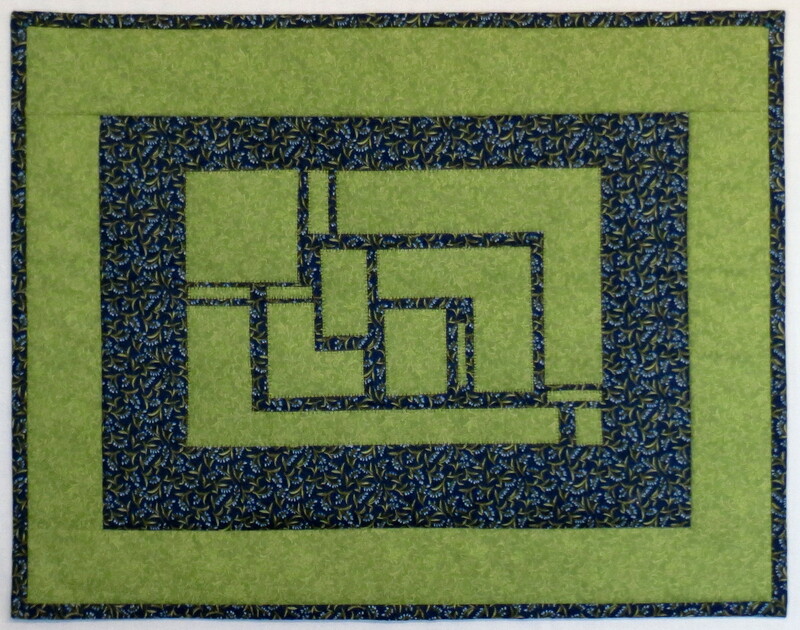 A cut up rectangle demonstrates the use of negative space in a quilt design. 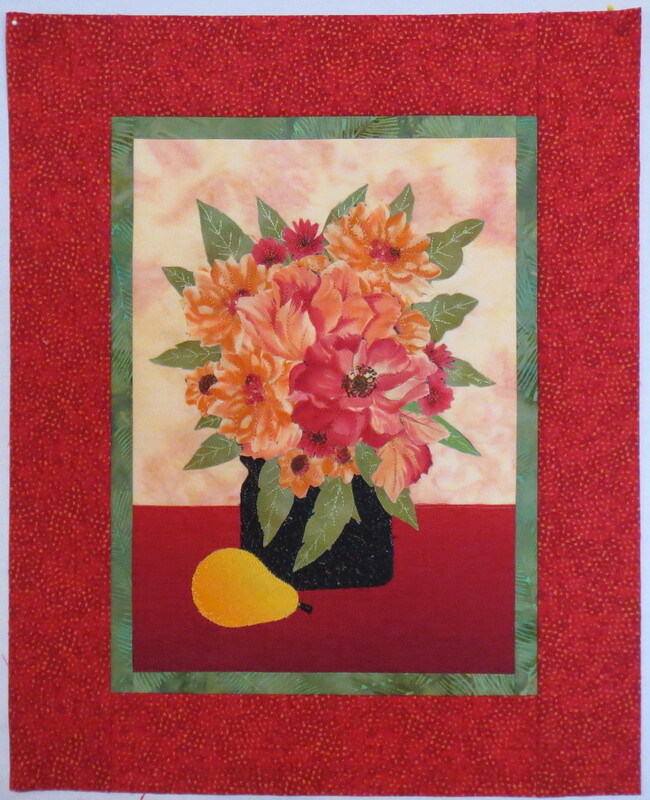 This entry was posted in applique, Art Quilts, Contemporary Quilts, Quilting and tagged abstract art quilt, Art quilting, art quilts, Broderie Perse, contemporary quilts, fusibles on August 13, 2013 by Shirley at Mystery Bay Quilt Design.